Despite winning five Tony awards including best new musical, Leonard Bernstein’s Wonderful Town has never quite been as popular as On the Town or West Side Story. It also employs the composer’s signature technique of portraying New York as more of a character than a setting, bringing to life the eclectic inhabitants of Greenwich Village in the 1930s. Bernstein and collaborator’s Betty Comden and Adolph Green capture the quirky nature of life in this metropolitan bohemia but the fairly unchallenging love story isn’t much of a hook on which to hang a show. Director Tim McArthur embraces the idiosyncrasies of the narrative and his ensemble cast rally to portray the mix of artists and entrepreneurs that make-up the Lower West Side. Aaron Clingham’s band provide a simple and effective interpretation of Bernstein’s score but Ian Pyle’s lively if occasionally intrusive choreography keeps the tone of the piece light. 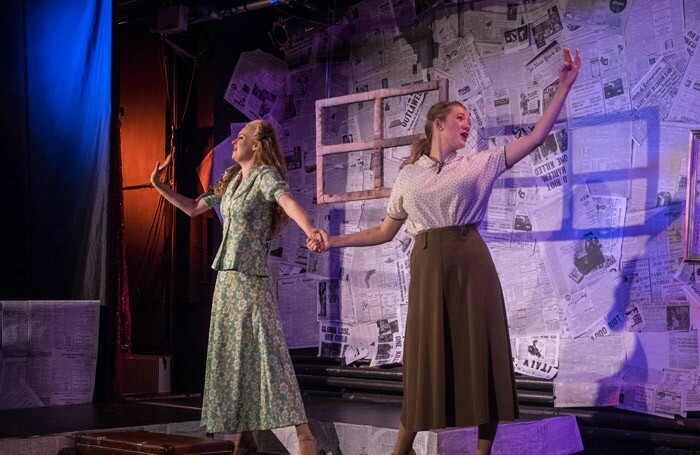 Undoubtedly the success of this show rests on the amiability of its female leads and in Francesca Benton-Stace and Lizzie Wofford, McArthur and his team have struck gold. Benton-Space is a distinctly self aware Eileen, taming cops and raising pulses around the block but it is her relationship with Wofford’s wise-cracking Ruth that defines this production. Alike enough to be genuine sisters, their rapport is established through the subtle harmonies of Ohio to the Brazilian madness of the Conga and beyond. Their double-act is so well-rounded that it only serves to highlight how thinly written Ruth’s love interest is – though he’s valiantly portrayed by Aneurin Pascoe. Despite the strength of the performances the production moves inexorably towards a strangely unsatisfying conclusion.